Add waste holding capacity in portable situations. Low profile design allows tanks to slide under trailers. Tanks may be hooked in a series to increase volume. 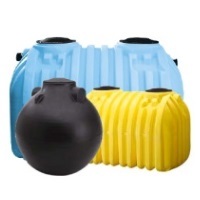 Plastic Mart offers job shack holding tanks by Quadel & Ace Roto-Mold which can be linked together for greater storage capacity. Job Shack Holding Tanks are used for those out of the way places where standard septic tanks or plumbing are not an option. We offer a few different shipment locations to serve you so arrival time may vary. We see deliveries ship from Quadel usually within a business day or two, Ace a few days longer. You should expect arrival anywhere from 4-5 business days up to two weeks. Custom fittings will add a few days to the order, whereas standard tanks tend to ship immediately. Is there a recommended set up? It’s pretty much case by case on our end as no two requests are usually alike. Unless special fittings are requested you will receive the standard set up that goes out to all our customers. Can job shack holding tanks store fresh potable drinking water? No, these tanks are made to store waste. The plastic used is not food grade for potable water storage. We recommend just buying a plastic water tank if that’s your intended use. How do I access the inside of a job shack tank? 8” Lids are installed on top and this would allow for complete access. With the variety of fittings that come standard on the tank, we don’t really ever get a custom fitting request on these. If you required it, it can more than likely be accomplished. Can the tanks be connected to each other? Yes, with the amount of fittings you should be able to connect two tanks using the standard fittings installed.